Long time readers of these pages will be aware that for years now my summer months have been punctuated by numerous short trips into Europe in search of obscure roller coasters. This year would almost certainly have followed the usual pattern were it not for my girlfriend's job having different weekend days to my own. Irish law provides for generous annual leave entitlements, but we decided that it made more sense to group days together so to minimise the amount of time (and money, dignity, sanity...) lost to air travel. There was, however, one trip that I really wanted to do that didn't fit into any of our longer plans, and thus we found ourselves at Dublin Airport on a Friday evening waiting to board a flight to Dusseldorf. Limited schedules meant that the city was our only realistic launching point, despite it being over five hundred kilometres from our first park and nearly as far from our overnight hotel. Our departure was delayed by over an hour due to an emergency on another aircraft, but in due course we arrived in Germany and began a thoroughly inadvisable three hour drive shortly after 9:30pm. We left our overnight hotel (after almost six hours of sleep!) in plenty of time to get to Hansa Park by opening, but a nasty crash on the opposite side of the A1 led to an hour-long tailback caused entirely by rubbernecking drivers. The relatively empty parking lot suggested that we were far from the only motorists to be caught out, but once inside the gates it was apparent that lots of people had travelled via other means. All six of the roller coasters had waits in excess of half an hour, and given that we decided we might as well head directly to the new ride. Schwur des Kärnan (#2137) is the tallest roller coaster to be built by Gerstlauer Amusement Rides by some margin, standing just under one hundred feet above the next in line. Visually the ride is hugely impressive, with a seventy metre concrete tower enclosing the lift and first drop, and a tangled bundle of track set high above the queueing area. The remainder of the layout remains low to the ground, allowing it to be enjoyed at considerable speed. The experience begins with a gentle turn, after which the train engages an enormous indoor vertical lift that will impress even the most jaded enthusiast. The climb to the top is normal until shortly before the apex, when the motor stops and the car free falls backward to ground level. This effect worked brilliantly, and in fact I'd describe the first section of the ride as top ten material. Unfortunately, the rest of the experience is closer to the other end of the leaderboard; once up to speed the trains clatter around the track in a not terribly comfortable fashion, and some of the transitions are actively bad, which is unforgivable on a brand new coaster. It was almost a relief when the train hit the brake run, though this was short lived as we entered a thoroughly pointless inline twist in the dark; I found myself wondering whether there had been a spare piece of coaster track in a warehouse somewhere that needed to be used up. It's also worth passing comment on one other feature of Kärnan that serves no obvious purpose other than to annoy guests. Immediately prior to boarding oncoming passengers are allowed into a pre-show room with four rows, each of which has space for four people. One might assume that those on the edges would cover front and back seats, but no; the air gates are opened in a random order each time, meaning that there is absolutely no way to select where you want to sit. I'm given to understand that the intention is for Kärnan's spell to make the choice, but this is asinine; guests who reach the station first should be given first refusal on front and/or back. It's also worth noting that the individual gates slow down boarding significantly and thus result in a longer wait time than would otherwise be necessary. We decided to rejuvenate on Nessie Superrollercoaster, the classic Schwarzkopf celebrating its thirty-fifth birthday this year. Only one of the three trains was in use, but the lone ride operator was keeping things moving, resulting in a wait time of less than ten minutes. While we waited I found myself looking at a display above the operator booth measuring the top speed at the base of the first drop; there was a variance of up to ten kilometres per hour between dispatches, suggesting that coaster speed statistics are approximations at best (sorry Duane!). As this was Megan's first visit to the park it was necessary to ride the coasters I'd otherwise be tempted to skip. The only obvious change to Rasender Roland was the removal of the fake railway sleepers that used to adorn the track; otherwise it was still an extended roller skater notable mainly for its unusually strong laterals. We went from there to Crazy Mine, where the brakes were being applied at the same stupid setting seen eleven years ago; every single mid-course brake brought a stop akin to a car crash, making it hard to understand why there was a thirty-five minute queue. Two enjoyable laps on Schlange von Midgard brought us to the final coaster in the park and one that I'd rather enjoyed in previous visits. Today, however, Fluch von Novgorod was not running well. We were a few seconds into the fast section of the ride when the first severe slam occurred. Moments later Megan shouted "I hate it" to the accompaniment of the LSM motors, and it was difficult to argue; while the experience might have been passable with lap bars, the level of roughness coupled with the unforgiving overhead restraint meant that things were, in two words, not fun. We spent a bit of time walking around the park before deciding to give Schwur des Kärnan a second chance. No backwards drop took place on this occasion, but otherwise the experience was as before; a good idea spoiled by poor implementation and a pointless inversion. It looked briefly like we'd be finishing our day with a back row on Nessie Superrollercoaster, but a slightly undignified powerwalk allowed us to get into the queue for the Holsteinturm observation tower moments before the queue closed for the night. It was early evening when we walked across the road from our hotel to an enormously crowded Summerdom. The evening sun was casting a beautiful light across the entire ground, and we decided to take advantage of this with a lap on the Riesenrad (Steiger), one of the largest transportable ferris wheels in the world. 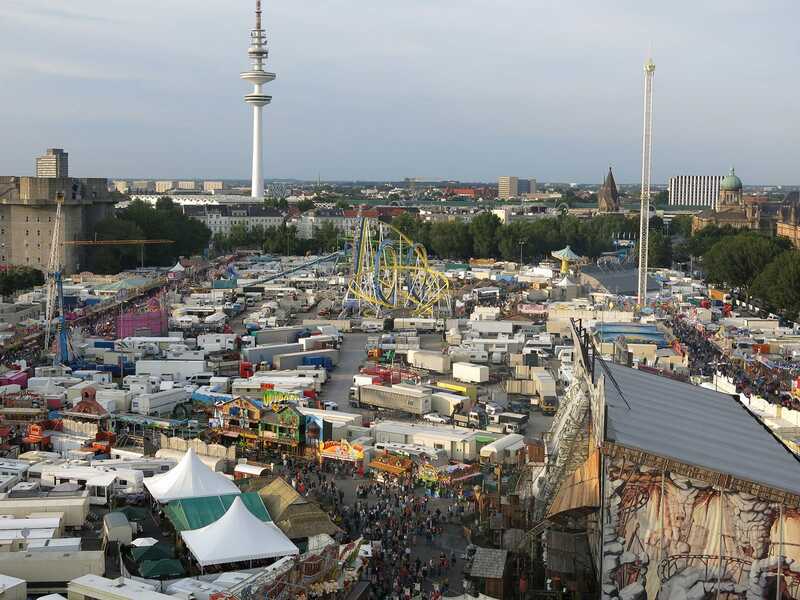 Our unobscured vantage point gave us a clear view of four different coasters as well as Michael Goetzke's Skyfall, an eighty metre drop tower that premiered at the Munich Oktoberfest in 2013. It was also interesting to see many of the machines from Hyde Park Winter Wonderland without their seasonal theming packages and London pricing. The one coaster on the ground that was new to both of us was a Wacky Worm clone named Kuddel der Hai (Belli) (#2138). The ride known to English speakers as Grant the Shark was equipped with a wide variety of theme elements, including a miniature lighthouse, lifebuoys, a parrot, loops of rope, a fountain, and several pirates. Even the train had a custom figurehead, as well as a row of lights along its base to make it stand out after dark. We didn't expect anything out of the ordinary from the ride experience, and thus were pleasantly surprised when the back seat delivered a noticeable pop of airtime on the main drop. It is worth noting in passing that there are (at least) five versions of this basic layout touring the German fair circuit, and all are decorated differently. The roster includes Crazy Jungle (Luxem), Doggy Dog (Zinnecker), Tom der Tiger (Wegener), and Willy der Wurm (Roos), and it seems almost inevitable that there will be more animals added to the menagerie at some point. I'm thinking Edwin die Erdferkel, Ferdinand der Fuchs, Geoff die Ziege or perhaps even Malcolm die Kröte. We decided to complete a lap on Euro Coaster (Buwalda) despite misgivings, on the grounds that it would have been rude to leave a coaster unridden. It took less than one hundred feet of track for us to realise that politeness should have taken second place to self-preservation instincts; the cars on this Reverchon-built Gliding Coaster jerked back and forth in a remarkably awkward fashion, with the passengers taking on the unwilling role of shock absorbers. I'm honestly surprised that this ride is still making money after almost fifteen years on the road, though perhaps its relative rarity helps, given that only one other model was built (with good reason!). 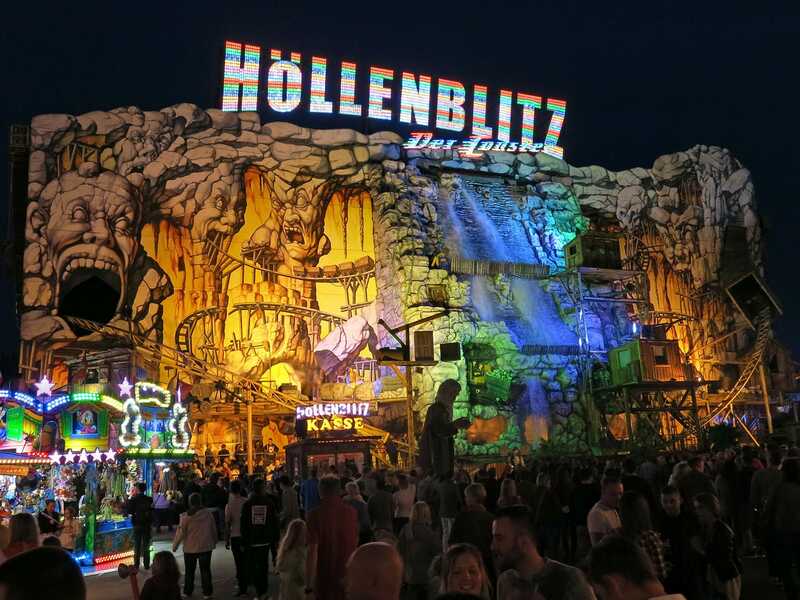 The main reason for fitting the Summerdom onto an already crowded weekend was the presence of Höllenblitz, the only substantial German fair coaster that Megan had yet to experience. There were no obvious visual differences to the exterior of the largest portable indoor coaster in the world (who thinks of these records anyway?) some six years after my last encounter with it, but even though I knew what to expect it was impossible not to be impressed by the elaborate lighting and slightly ridiculous artificial waterfall stretching at least fifty feet into the air. One of the three fifteen-car trains thundered across the facade as we bought our tickets, building anticipation for what was to come. My only detailed write up of the on-board experience, written seven years ago, was somewhat blasé about what I described as Christmas trees inside the ride tent. Since that time Herr Renoldi has made upgrades to his machine; tonight an enormous number of coloured lights, fog machines, coloured lasers, and even a fire effect coupled with powerful spinning to deliver a thoroughly enjoyable ride that we simply had to do a second time. The layout seemed impossibly complex given the space available; one of these days I'd like to see the interior with overhead lights on just to see how much clearance there really is. The final coaster of the night was Teststrecke, six years to the day since my last ride on it. 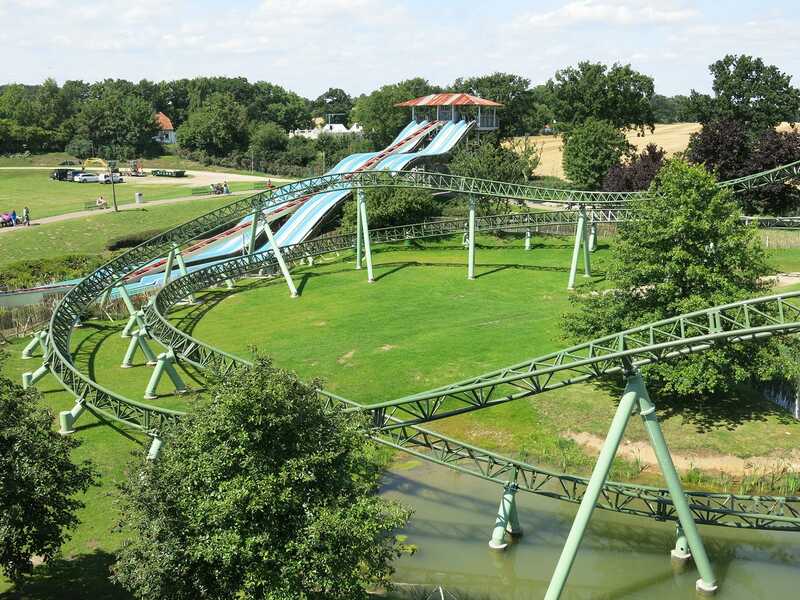 In that time the only remaining Doppel Looping has gained an elaborate new facade for its pay box, as well as two additional trains, albeit of a modern design rather than original Schwarzkopf rolling stock. My criticisms from before hold; they negotiate the track well, but are hobbled by a restraint design that isn't comfortable for all body types, including mine. Megan still wanted to do a second lap, as she had fond memories of what the ride used to be, and I was rewarded for joining her with my own personal lap bar bruise to take home.